Liverpool defeated Newcastle 6-0 at St James’ Park. 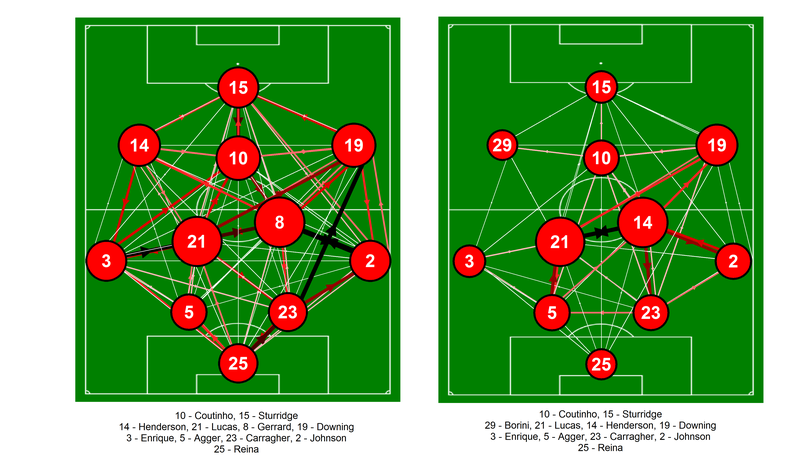 Below is the passing network analysis for Liverpool split between the first 75 minutes of the match and the rest of the match up to full time. I focussed just on Liverpool here. More information on how these are put together is available here in my previous posts on this subject. The reason I separated the networks into these two periods was that I noticed how Liverpool’s passing rate changed massively after Steven Gerrard was substituted and the fifth goal was scored. During the first 75 minutes, Liverpool attempted 323 passes with a success rate of 74% and a 45% share of possession. After this, Liverpool attempted 163 passes with an accuracy of 96% and a 60% share of possession. Liverpool attempted 34% of their passes in this closing period. Let’s see how this looks in terms of their passing network. The positions of the players are loosely based on the formations played, although some creative license is employed for clarity. It is important to note that these are fixed positions, which will not always be representative of where a player passed/received the ball. The starting eleven is shown on the pitch for the first 75 minutes, with Borini replacing Gerrard in the second network. Passing networks for Liverpool for the first 75 minutes and up to full time against Newcastle United from the match at St James’ Park on the 27th April 2013. Only completed passes are shown. Darker and thicker arrows indicate more passes between each player. The player markers are sized according to their passing influence, the larger the marker, the greater their influence. Click on the image for a larger view. Liverpool’s passing was quite balanced for the first 75 minutes of the match, with a varied passing distribution. There was a stronger bias towards the right flank compared with the left flank as Gerrard drifted right to combine with Johnson and Downing. The passing influence scores were also evenly distributed across the whole team with Gerrard and Lucas being the top two. A contrast with some previous matches is the lack of strong links along the back line, which indicates less reliance on recycling of possession in deeper areas. Instead, Liverpool were seeking to move the ball forward more quickly and played the ball through the whole team. After Gerrard and Lucas, the next most influential player was Coutinho, who put in a wonderfully creative performance as the attacking fulcrum of the team. He linked well with all of Liverpool’s forward players and threaded several dangerous passes to his team-mates including an assist and a ‘second goal assist’ (defined as a pass to the goal assist creator) for the second goal according to EPL-Index. His creative exploits thus far have been hugely promising during his first 10 appearances. The final period of the match saw Liverpool really rack up the passing numbers as mentioned earlier. Clearly, this is easier to do when 5 or 6 goals clear but it is still potentially illustrative to see how this was accomplished. The main orchestrator’s of this were Lucas and Henderson who were 28/28 and 35/35 for passes attempted/completed during this period. Henderson was 21/24 from the first 75 minutes, so this was quite a rapid increase with his shift in role after Gerrard went off and the state of the game. Admittedly Newcastle were very poor in this match but Liverpool took advantage to enact a severe thrashing. This was accomplished without Suárez, which leads to obvious (premature?) questions about whether his absence improved Liverpool’s overall balance and play. Assuming that Suárez doesn’t leave in the summer, one of Bredan Rodgers’ key tasks will be developing a system that gets the best out of the attacking talents of Suárez, Coutinho and Sturridge. It could be quite tasty if he manages to accomplish this. This entry was posted in English Premier League, Liverpool, Network Analysis, Passing and tagged EPL, Liverpool, Network analysis, Newcastle Utd, Passing by Will Gurpinar-Morgan. Bookmark the permalink. how do you collect the raw data about a game? the network is only ball movement? You can get the data from the StatsZone app. The data is based on completed passes between players.